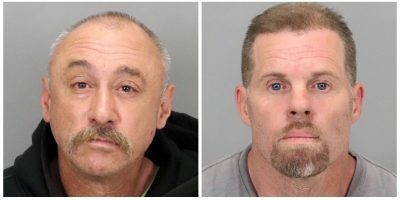 Two of three men suspected of kidnapping and murdering a Cloverdale man over marijuana last month appeared in Sonoma County Superior Court Friday morning. Socorro Sierra, 34, of Healdsburg, and Climmie Smith-Hall, 30, of Santa Rosa, were appointed attorneys and served a criminal protective order to stay away from the family of the murder victim, 46-year-old Jose Martinez. They were arrested this week and are being held under no bail in the Sonoma County jail. Sierra and Smith-Hill were arraigned Thursday on kidnapping and first-degree murder charges and will return to court Aug. 7 to enter pleas. A third man, Felix Fernando Carreon, 43, of Santa Rosa, has not yet been charged in the case, Deputy District Attorney Barbara Nanney said this morning. Carreon is scheduled for a preliminary hearing Tuesday on a felony charge of possessing a leaded cane, or billy jack, and on misdemeanor charges of possessing methamphetamine and an opium pipe. He has been in custody on those charges since July 10. The Sonoma County Sheriff’s Office said Martinez may have been involved in “significant” marijuana dealing. His family members declined to comment on the arrests and the marijuana allegation after the brief court hearing this morning. Martinez was missing since June 29, and his daughter thought he might have gone on a fishing trip in his white Toyota Tacoma truck, sheriff’s Sgt. Spencer Crum said Thursday. On July 2 Martinez’s family reported him missing to the Cloverdale Police Department and a “be on the lookout” was issued to law enforcement. Family members and friends told Cloverdale police that Martinez might have been involved in significant marijuana deals and that he had been receiving threats lately, Crum said. The family feared his disappearance was more than a missing person case, and sheriff’s detectives and Cloverdale police began investigating, Crum said. A sheriff’s deputy found Martinez’s truck on Masterson Court and Holiday Street in Santa Rosa on Tuesday morning. The truck’s license plates were removed and replaced with paper dealer license plates, but the truck’s VIN number showed the truck was registered to Martinez, Crum said. The investigation led to the identification of the three suspects, Crum said. Detectives determined Martinez and Socorro had significant marijuana dealings, and Sierra recently had threatened Martinez regarding a business transaction, Crum said. Detectives also learned Martinez went to Ray’s Food Place on Cloverdale Boulevard at 8 p.m. June 29. Investigators believe the three men in a dark sedan kidnapped Martinez in front of the store and he was taken to the top of Geysers Road near the Calpine geothermal plant, Crum said. Sierra allegedly walked Martinez to a remote spot near a creek and shot him with a handgun, then drove the other two men to Santa Rosa, Crum said. Sierra returned to Geysers Road the next day, wrapped Martinez’s body in a tarp and drove it to a marijuana garden in the 2100 block of West Dry Creek Road in Healdsburg, Crum said. Sierra and Carreon rented a backhoe, dug a five- to six-foot deep hole and buried Martinez, Crum said. Detectives learned about the burial site, and on Wednesday they recovered Martinez’s body. An autopsy by the Sonoma County coroner’s office is scheduled for today, Crum said. Sierra was arrested Tuesday in the parking lot of the Safeway store on Guerneville Road, and deputies found a handgun in his car that is believed to be the murder weapon, Crum said. Smith-Hill was arrested after an interview at the Sonoma County Sheriff’s Office Wednesday.